» Basal Cell Carcinoma, which accounts for more than 90% of all skin cancers in the United States. It is a slowgrowing cancer that seldom spreads to other parts of the body. » Squamous Cell Carcinoma, which rarely spreads, but does so more often than Basal Cell Carcinoma. » A third, less common, but far more serious type of skin cancer is Melanoma. Melanoma accounts for only about 4% of all skin cancer cases, but it causes most cancer related deaths. The good news is that even the most serious Skin Cancer is often curable if it is detected and treated in its early stages. Photodynamic therapy (PDT) – This treatment destroys skin cancer cells with a combination of laser light and drugs that makes cancer cells sensitive to light. PDT makes your skin sensitive to light, so you will need to avoid direct sunlight for at least six weeks after treatment. Excisional surgery – This type of treatment may be appropriate for any type of skin cancer. Cancerous tissue is cut out (excised) and a surrounding margin of healthy skin. A wide excision — removing extra normal skin around the tumor — may be recommended in some cases. 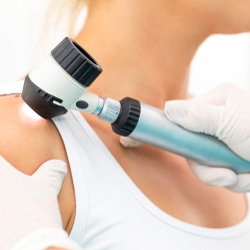 Laser therapy – A precise, intense beam of light vaporizes growths, generally with little damage to surrounding tissue. This therapy may be used to treat superficial skin cancers. Mohs surgery – This procedure is for larger, recurring or difficult-to-treat skin cancers, which may include both basal and squamous cell carcinomas. The skin growth is removed layer by layer, and each layer is examined under a microscope, until no abnormal cells remain. This procedure allows cancerous cells to be removed without taking an excessive amount of surrounding healthy skin. Dr. Heinrich specializes in the removal of these skin cancers as well as the cosmetic reconstruction (Scar Revision ») of the affected area.